Making rapid progress to the end of Blue Highways, we stop for a while in New Harmony, Indiana with William Least Heat-Moon (LHM). What is apparent to all of us, I think, is that a journey into the unknown, one where we don't know the road, might be a journey where we learn the most about the world and about ourselves. To think that one of our first stops on this Littourati journey was just 10 miles north at Grayville, Indiana. The circle is almost complete. I find the Indiana state flag, at right, to be almost symbolic of this completion. If you want to see where this little result of the attempt to create Utopia in middle America lies, please consult the map. "Not far from a burial ground of unmarked graves that the old Harmonists share with a millennium of Indians, the mystical Rappites in 1820 planted a circular privet-hedge labyrinth, 'symbolic' (a sign said) 'of the Harmonist concept of the devious and difficult approach to a state of true harmony.' After the Rappites, the hedges disappeared, but a generation ago, citizens replanted the maze, its contours strikingly like the Hopi map of emergence. I walked through it to stretch from the long highway. Even though I avoided the shortcut holes broken in the hedges, I still went down the rungs and curves without a single wrong turn. The 'right' way was worn so deeply in the earth as to be unmistakable. But without the errors, wrong turns, and blind alleys, without the doubling back and misdirection and fumbling and chance discoveries, there was not one bit of joy in walking the labyrinth. And worse, knowing the way made traveling it perfectly meaningless." Downtown New Harmony, Indiana. Photo by Timothy K. Hamilton and hosted at Wikimedia Commons. Click on photo to go to host site. What is the point to know the way? I'm sure that anyone reading this can point out a number of reasons why its important to know the way, and can reel off at least five. Here's mine. You don't get lost. You save time. There's comfort in the familiar. You'll never have any surprises. It's safe. These are good reasons, but I have some good questions about them. Yes, in knowing the way one doesn't get lost. For instance, I knew backwards and forwards the roads around my hometown. I knew how to get here and there. When I lived in Milwaukee, I had all the best routes to this place and that in my head. Same for San Antonio and New Orleans. But what happened? Once those routes were new. I paid attention to what was going on around me, because I had to be aware. Then, one day, I stopped paying attention. I missed details in the surety of my route. I ceased to notice little changes, so focused was I on getting from Point A to Point B. I would never take an alternate route, and therefore I ceased to be surprised, to see new things, and I denied myself new experiences and a chance to grow. Sure, in knowing the way one saves time. It's not efficient to be driving or wandering about on streets that you don't know. After all, if the goal is Point B, why visit Point C, D and E in the interim? You have places to go, things to do, people to see. But what happens when you take your time and explore? You see things, meet people and experience things that you might have never allowed yourself to experience. In all my life's journey, I have never seen much of a correlation between saving time and growing personally. Of course, there will always be comfort in the familiar when one knows the way. But my analogy here relates to bed sores. When you look at a soft, downy bed, what do you think of? Comfort! That "aaahhhh"ness of pushing your head against a soft pillow, the warmth of the blankets surrounding you, that dozing feeling. But what happens if you spend two or three straight weeks in bed? That familiar feeling becomes your bane. Without movement and change you develop bed sores, which are painful and difficult to treat. Your comfort has suddenly become your curse. We can always come back to the familiar, but we need change and new things to stimulate us and stave off an existential putrefaction. Do you never want to be surprised? Sure, there are bad surprises, and knowing the way will often mitigate the potential to be surprised. The man with the machete hiding in the back seat of a car is not the kind of surprise any of us could want. But how often does that happen? Most often, surprises are the harbingers of change in our lives, and with change comes self-reflection and opportunity. I've been surprised lately by many things. A close relative's illness, a house that it appears I will buy, a nomination for an outstanding teacher award, and organizational shake-ups at my office. Each has it's share of headaches and even heartbreak. I hate to see my family member have to deal with a serious health issue. The house has some maintenance issues that will cost money, as well as a major sewage issue that must be solved before I buy it. To get the outstanding teacher award, I must write a teaching philosophy, track down letters of support, and find the class evaluations I filed away. The change at my office has left me feeling unsure about my role. But each change is a window of opportunity. My relative's illness means that my family will have to change and may or may not provide a new avenue to dealing with our dysfunction. Owning a house, after a lifetime of renting, will challenge me in ways I've never been challenged before and will be a new rite of passage in my life. Just being nominated for the outstanding teacher award has given me new confidence in myself - imagine what I'll feel like if I win the award! The change in my office will allow me to create my role, and maybe even expand it and my influence. It may offer me a way toward further promotion and advancement. It's all in how I choose to frame the surprises and the consequences that come with them. Which brings me to the last reason for knowing the way that I want to question. It's safe knowing the way. Being safe is fine. We all want safety and security. But safety and security, while prolonging well-being and maybe even life, can become a prison. People can hide behind safety and security and never allow themselves to see beyond the walls and disarm their personal defenses. And what good is that? I've been there, and I've decided that to experience and see things different than what I know, to open myself to other viewpoints and opinions, is the best way for me to grow. It's earned me a reputation of being eclectic, maybe even a little weird in my tastes, but I like it. New Harmony symbolizes the end of a journey of Utopians, who thought that they could tame nature and their own shortcomings, and in the strength of togetherness create harmony, unity and a sense of unchanging peace in the middle of a wilderness. However, to grow we often need disharmony and disunity to provide us with challenges. As the two utopian experiments at New Harmony prove, drastic and catastrophic change often messes up the best of plans and desires. The people creating utopias at New Harmony planned their way, they had their philosophy, they created what they thought was safety, and they still couldn't overcome rapid moving challenges. Had they gone in with flexibility, knowing that there isn't one way but many, and it's when we try to force things to conform to us rather than allowing ourselves to experience and adapt that we get in trouble, they might have survived. LHM learned that his trip had meaning precisely because it wasn't planned, it wasn't familiar, it wasn't safe, and it sometimes wasn't comfortable. He even got lost a few times, and found himself afraid, but he traversed the labyrinth of his journey, survived, learned and grew. May we all allow ourselves, at least once in a while, the opportunities to get lost, make time, be uncomfortable, be surprised, and take risks. I've used this song before, but I had to use it again here. Youngblood Brass Band, featuring Ike Willis, with Something. We stop for a walk with William Least Heat-Moon (LHM) in Maryhill, continuing to ponder on some large questions of life and time. In this case, why do we bother to try to realize dreams that crumble and blow away over time? Sounds depressing? I don't think so. I think it just is. Navigate over to the map to pinpoint Maryhill. "Sam Hill had many plans - some shrewd, some cockamamie - and he had money to try them. His plan for Maryhill, Washington (first called Columbus), was to find a narrow zone where coastal rains met desert sun; that belt, he believed, would be an agricultural Eden....He talked some Belgian Quakers into considering settlement, but when scouts for the group came, they saw and left. To them, Hill's ideal zone was the fiction of a creative road engineer more adept at theory than practice when it came to agronomy and climatology. And they were right. The town lay in the rain shadow of the Cascades. "....But Hill died....Hill's dream had passed, and now, but for the museum, monument, and the ruined rock walls, the desert slope was as vacant as ever." The Maryhill Museum in Maryhill, Washington was built originally as a mansion by Sam Hill. Photo by "Cacophony" at Wikimedia Commons. Click on photo to go to host site. What happens to our plans, our dreams, and when we realize them, our creations? I have been thinking a lot about his as I have been writing these posts in this blog. LHM's account in this chapter of Blue Highways about Sam Hill and his ideas have brought these thoughts back to me recently. I have to frame this question by first asking: What's the point? What's the point of creating things, especially if they will end up like Sam Hill's vision of Maryhill, Washington? He had great plans. Plans that were, as LHM says, "some shrewd, some cockamamie." He put his plans into effect. He built a large "castle" for his wife. He hoped to build a settlement that made use of what he thought might be the perfect meeting place of aridity and humidity for an agricultural wonderland. Instead, the settlement didn't happen. The climate was not right for agriculture after all. His wife didn't want to go anywhere near Maryhill. All that is left, according to LHM, are a few buildings, a ghost town, and a facsimile of Stonehenge up the hill. What was the point of that? What was the point of the great civilizations whose remnants are crumbling under our feet over the millenia? The Hittites and Babylonians. The Greeks, the Romans, the Egyptians. The Mayans, Aztecs and Inca. The Cahokia Mound Builders, the Chacoans and the Mesa Verdeans. The Mongols and the early Chinese empires. What was the point of their civilizations if now all that is left is what can be saved through archeology? Percy Bysshe Shelley summed up the hubris of pride and of civilization in a memorable way in what is one of my favorite poems of all time, Ozymandias. I am but a bit player in these things, but I have been realizing that even my small contributions to our current civilization are but tiny blips that will burn briefly and then die. Living in the present, it is easy for us to believe that things that we produce are timeless - our writings, our art, our music. Yet only a fraction of the literature and art that has been produced through the millenia of human existence has survived. How many wondrous works of art might there have been that we have missed? How many amazing pieces of literature have been lost over time? What lost symphonies or masterworks of song have had their notes briefly sound and then disappeared? As I write these lines that will be saved electronically on the internet for you to read, I am conscious of a number of things that could happen. They could be lost due to a catastrophe with the server. I could run into dire straights and find that I cannot pay my bill to keep my account on this provider. As we move forward in time, perhaps the provider might not survive and go out of business, taking my posts with it. As we move forward through years, decades, centuries, how do we know that the internet will survive beyond a brief flowering? How will we know that our civilization will survive - civilizations up to now, even those that seemed in the midst of their greatness to be guaranteed to last forever, eventually fall and die away. So why do I, the Sam Hills, the architects of civilizations dream and create works that will eventually dissolve in the relentless march of universal time and movement? I can only answer for myself. I wite these posts because it pleases me. I also write the occasional poem, make Facebook posts and dream of writing a book someday because it is my one little sound in the vast cacophony of the universe, my one word in the encyclopedia of creation, my one spark of energy to add to the immense energy of the wider cosmos. Of course, I would love for my creations, for my small part to play in the ongoing history of humanity, to last and have some relevance. But that is just my bit of hubris. What I create may be relevant or not, but eventually my creations will disappear and my voice will fade. Just like Maryhill, the great civilizations, and all our arts, literature and music will eventually follow Ozymandias and crumble forgotten into the infinite and unrelenting cosmological desert. Other towns, civilizations, arts, literatures and musics will follow and in their turn disappear and be replaced. And that's just fine, and just as it's meant to be. I had a hard time picking this song. I looked up music that might have something about Ozymandias, and though Jefferson Starship, the Sisters of Mercy, and Qntal all had songs with that name (and I am really partial to the Jefferson Starship song), I kept coming back to this song by Midnight Oil, even though it really has nothing to do with what I'm writing about. I even went to songs about time's passage, and looked briefly at another song I like, Steely Dan's Black Friday. But this kept popping back in my head. So, if it's supposed to be in this post, it will be in this post. And I think it can fit, because when all is said and done, isn't life and all our creations like a dream that will one day fade and end? Enjoy Dreamworld! I feel like this post might ramble a bit, but I think LHM was really trying to make sense of time and space and put it all together in the context of his trip. I don't think he expected to run into a replica of Stonehenge in southern Washington, and frankly, I didn't expect that we'd have such a thing either. I mean, I know that there is Carhenge, made out of cars, and there is a henge made out of old refrigerators. But a full replica? That's pretty cool. To see where Stonehenge on the Columbia sits, see the map - be sure to zoom in with satellite mode to actually see it! "....In truth, the circle of menhirs was a ferro-concretehenge, but it was as arresting on its hill as the real Stonehenge on Salisbury Plain." Stonehenge on the Columbia River, near Maryhill, Washington. Photo by Gregg M. Erickson and in the public domain at Wikimedia Commons. Click on photo to go to site. There is an awful lot of self-reflection on the part of LHM in this chapter when he finds Stonehenge on the Columbia. It affords us a good time to do some reflection as well. I'll give a short synopsis of what LHM reflects upon. When he finds this Stonehenge, quite unexpectedly, LHM is first struck by the convergence of past and present, which happened to him once before at the Navajo petroglyphs of Hickison Summit. He remarks that this Stonehenge was built by a Sam Hill to commemorate the sacrifice of American doughboys in World War I, and how some graffiti on the monument gave it a kind of historical authenticity even though it was simply a mask of another more authentic monument far away. He finds a Polaroid of a naked woman posing by some of the stones...her pendulous-breasted pose in the fading light hearkens to something more primal and elemental. LHM then discourses on time. He discusses how when we look at the stars that we look into the past, and speculates that when a telescope is built that can look back to the beginning of the universe, astronomers will be looking at the beginning of time and at the matter that now makes up the human race. The original Stonehenge, he says, was an attempt at a time machine, one that could take the starlight - straight out of the past - and use it to predict future seasons and astronomical phenomena. He begins to connect all that he sees around him in the universe and concludes that to escape his ego, that narrowness of now, and achieve concord or union with all things he has to reach outward - to embrace the past and the future. I remember having this sense of things interconnecting in, of all places, New York City at the Metropolitan Museum of Art. There, in a wing all its own, is the reconstructed Egyptian Temple of Dendur. This temple was given to the United States by the Egyptian government because it was to be submerged by the waters of the Aswan High Dam and because the United States had assisted in rescuing other sites of archeological significance. One thing that captured my attention when I saw it was the grafitti on the temple. One in particular stood out - an inscription by a man in the 1800s who was from Brooklyn. I can imagine that, in the middle of the African desert, the man who carved his name into the temple in the 1800s thought that it would remain there in perpetuity. Instead, his name ended back up in New York City three generations later. I laughed at the irony of it all, a cosmic irony that shows that nothing in our world is permanent and fixed even when we "build it to last forever." I realize now that the places that I've carved my name, physically and in the virtual world, will also fade over time and that any remembrance of me might also end up being a delicious bit of irony if it survives at all. I am also struck by how the original structure of Stonehenge, in England, was built as somethat that was functional. We are still trying to decipher the exact function of Stonehenge, but theories include an astronomical observatory, a religious center, a place of healing and a place of burial. However, nobody quite knows. Regardless, it did perform a function, and in its longlasting mystery gained prominence as the last remnant of a millenia-long-dead and unknown culture. In a way, it serves as a gravestone for that culture it represents, and its mystery is the epitaph. On the other hand, the Stonehenge on the Columbia was built specifically as a memorial. It has no other function. There is no mystery. It was never used as an observatory other than those who, like LHM, looked out at the stars and pondered the mystery of time and space from within its concentric circles. It is not used to predict planting and harvesting seasons, or to foretell eclipses. We have much better ways for doing those functions now. Nobody brings themselves or their loved ones to Stonehenge on the Columbia for healing, unless somehow the hope of the founder in establishing the memorial somehow has some healing effects on long-standing and vanishing pain from the First World War. Sam Hill, who built the monument, was mistakenly told that the original Stonehenge was used as a sacrificial site and he wanted to memorialize the young men of Klickitat County, Washington who were sacrificed to the god of war. There are many places of past function that have turned into monuments. Almost every monument we are left with once had function. Yet, I have to wonder if the functional structures that we have built today, our modern buildings of concrete and steel, will one day become monuments. Just as the pyramids rise above Egypt, will our Empire State Building and Sears Tower, or their remains, become tourist sites for tourists trying to capture a dead culture. Just as we read about the Alexandria Lighthouse, which was one of the Seven Wonders of the Ancient World, will people in the future be awed when they learn about the Golden Gate Bridge, a monument to our civilization's current and maybe past greatness? I've never heard of a monument turning back into something functional in other ways. That was before I went to the Star Axis in New Mexico. It is a work of art being built into the side of a mountain. Aligned with the axis of the earth, it allows one to walk through past alignments of the Earth with the stars, and future alignments also. Because the Earth wobbles on its axis, the North Star of the time of the Egyptian pyramids was a different star, Thuban, than our North Star today, Polaris, which is different from the North Star of 10,000 years from now, Vega. I wonder if after our civilization is dead, and if there is a time when humanity enters a period not unlike the Dark Ages when knowledge is not widely disseminated as now but is perhaps kept alive by small groups devoted to learning, if this huge sculpture will become functional and serve a purpose other than as a sculptor's long-envisioned project? If we look to the past, we can certainly take pride in our accomplishments as a civilization. We see where we've come from and how we've progressed. But we can also possibly see our future in the past. Civilizations die, and are replaced by new civilizations, just as if we gaze into the cosmos, we look into the past and see our future in the stars that have been born and have died before our star and world existed. We live in the now, and think it will never end, but all that seems permanent will fade. As LHM says, our present will become our past and our future will become our present, and try as we might to fight it, change renders all impermanent. One of the funniest scenes in the mock-documentary, or rockumentary, called This is Spinal Tap is the scene where the titular band performs their song Stonehenge. I am putting the full version of the song here, but if you want to see the scene in the movie where the band's grandiose plans to have a giant version of Stonehenge lowered to the stage end up hilariously wrong, look at this YouTube video. Click on Thumbnail for MapToday's post is a contemplation of time and space, brought about by William Least Heat-Moon's (LHM) own musings as he continues through Texas in Blue Highways. As he says, Black Elk looked from a great height and understood more than he saw, but LHM says he sees more than he understands. We all feel like that sometimes. Click on the thumbnail of the map to see, if not understand, our place in time, space and our own mental geography as we continue our journey. "....The aura of time the mound gave off seemed to mock any comprehension of its change and process - how it had grown from baskets of shoveled soil to the high center of Caddoan affairs to a hilly patch of blackberries. My rambling metaphysics was getting caught in the trap of reducing experience to coherence and meaning, letting the perplexity of things disrupt the joy in their mystery. To insist that diligent thought would bring an understanding of change was to limit life to the comprehensible. "A raw scorch of lightning - fire from the thunderbird's eye - struck at the black clouds. A long peal. Before the rumble stopped, raindrops bashed the blackberry blossoms, and I ran for Ghost Dancing. Warm and dry, I watched the storm batter the old mound as it worked to wash the hill level again." 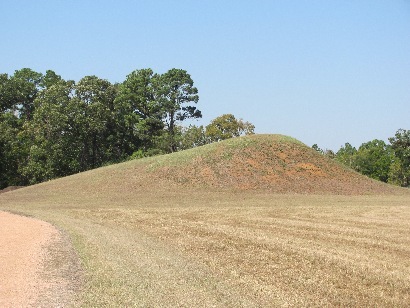 A Caddo burial mound at Caddo Mounds State Historic Site near Alto, Texas. Did William Least Heat-Moon contemplate this mound? Photo by Dana Goolsby at http://www.texasescapes.com. Click on photo to go to host site. Time is always a mystery to me. It's a dimension that seems to mock my comprehension of the universe and how I understand it. We live with time. Time moves constantly, forward without stopping, and we are all subject to it. I understand, at least on an intuitive level, space. I don't exactly know what constitutes space, but I realize that we exist within space. I spread my arms and realize that I take up space. I understand that even where I seem solid, I really am a collection of cells and molecules and atoms. There is space between my constituent building blocks that can be penetrated by particles that are small enough, and so space permeates me. I understand movement within space. I remember my basic physics that tells me that an object in motion will stay in motion until it encounters friction from other objects. I understand that everything moves within space, from the galaxies, stars and worlds to the basic atomic structures that form everything that we know. But time is incomprehensible to me. Don't misunderstand, I don't spend a lot of energy worrying about time. But every once in a while, such as when I'm presented with a musing or some other reason to contemplate time, I still come back to the same questions. What really is time? Why does it constantly move forward? Can anything stop time? Is there one time, or are there many times moving in parallel? Once a certain time has come and gone, is it completely over, or does all time exist at once and do we only comprehend our own experience of it? Why is it that physics seem to indicate that time travel, or something approximating it, is only possible to the future but not to the past? I understand that there are paradoxes if one were to go back in time, the "if you kill your own grandfather would you cease to exist?" problem. But why does the past sometimes seem as if we can almost touch it, and the yet the future is always such a mystery? I often wonder if, in large or small ways, I affect time, or if it is simply a machine set in motion and I am nothing to it. When I sit down to watch a football game and things start going bad for my team, I wonder if events might have been different had I not watched at all. In other words, was there a time and event crossroad occasioned by my choice to sit and watch the football game, or did it matter at all? Do my choices intermingle with others' choices and if so, do some have more influential choices than me that affect future time and events? Or are future events set and we careen toward them with no chance of altering them even if we knew what they were? I have stood in historic spots like the Caddo Mounds that, as LHM says above, give off "an aura of time." I have stood in those spots and felt the past surround me and permeate me. I have even felt a connection with the past. A year or so ago, I was standing outside a Norbertine retreat center near Albuquerque, in the desert on the gentle slopes of a mesa near the Rio Grande. The silence was overwhelming, except when an occasional breeze rustled the native grasses. Suddenly, I felt a distinct thump. I'm not sure why there was a thump - maybe I had startled a rabbit and it had thumped a warning or, maybe it was something more metaphysical. The sound startled me to attention, and I looked around. There, just about a body length away from me, was a potsherd. It was the fragment of a pot used by the Indian dwellers of the area in a time long past. There was no telling how old it was. It sat there, white with a small section of the pot's design painted and still seemingly vibrant and alive. I bent down and picked it up and examined it, feeling its texture and marveling at the bit of design. For a moment, I felt connected to that past. I wondered if, in that same spot some unknown number of centuries ago, someone using that pot also heard a thump, looked around, and felt my future presence. If you want a sense of the past and the present colliding, go to Rome. It is a living museum of the past, and you cannot walk into the Colosseum, with the sounds of Rome's traffic swirling around you, and not be instantly transported back to ancient Rome. You can almost see, vivid and vibrant in front of you, a newly constructed Colosseum, its benches filled with spectators watching a fight between a tiger and a prisoner, or a mock sea battle being staged on the flooded arena floor. At a gladiatorial contest, might a Roman patron suddenly sense the presence of an Ohio tourist in our present day standing beside him at the entrance to the arena, both observing what they can see and imagine, just for a moment before the feeling vanishes and the patron hurries to his seat to see the next battle and the tourist hurries to catch his wife who is already moving toward the Forum? I think much more about time now that I am in my middle age. I wonder when my life will end and time will stop for me. I think of civilizations that have come and gone and will rise and fall. I wonder if time will eventually run down and stop, like a slowing watch that needs to be wound. Does the eventual end of the universe, whether that constitutes a big collapse or instead, the speeding of matter into a dispersed nothingness, mean that time itself will finally meet its end? I sit and wonder, and in that moment of wonder I am connected through time and space with all that was, is and will be. I am connected with all of those before and after me who have sat and will sit in wonder and contemplate the same mystery. Then, like LHM, I go and resume my own journey through time and space as I comprehend them.